** This Tutorial will be updated when the new markbook is released in 2015! You can create a ‘custom spread’ in the markbook, which appears as another column highlighted in yellow as if it were a task, that is a summation of the results of the tasks you wish to attribute to it. You can weight those tasks equally in that summation or as you like, and the mark that appears in this ‘custom spread’ can even be used in manage marks to look at the rank and mark distributions for your students for a subset of tasks. This is useful for obtaining a ‘final mark’ for the whole year… as manage marks is a semester based summary (You create a column which incorporates all tasks for the year, then view that column’s spread in manage marks). NB: These ‘custom spreads’ are purely for your reference and will not appear on reports. 1. From the ‘Classic’ menu, drop down learning and click ‘Markbook’. 2. 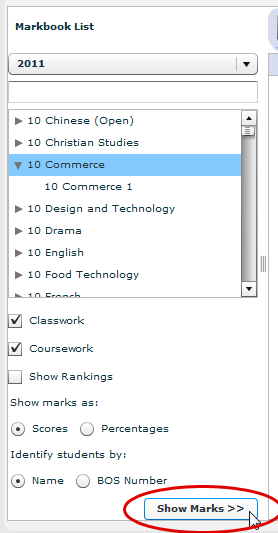 Select your course/class from the column on the left, then click ‘Show Marks’ (we are using 10 Commerce as an example here). 3. Tick the tickboxes at the top of the tasks that you want to include in your custom spread (examples circled in red below. Once you have ticked everything you want included, click on the ‘Custom Spread’ button (circled in orange below). 4. Give your custom spread a name. You can optionally give your custom spread a mark out of, if not it will show a percentage mark. 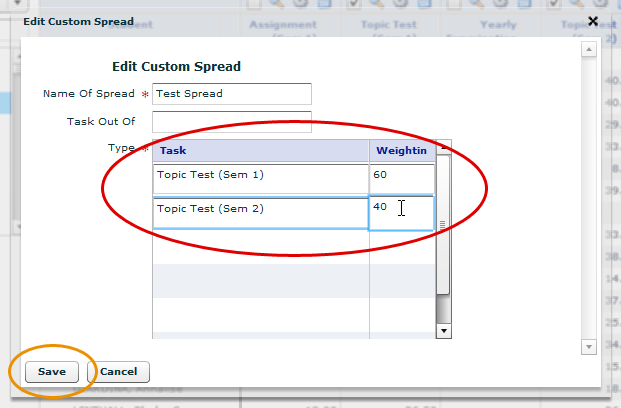 You can also optionally assign custom weightings to the tasks you have included (circled in red below). Once you are finished click the save button (circled in orange below). 5. Your new custom spread will appear similarly to the tasks, however will be highlighted in yellow to indicate it is a custom spread and only for reference. 6. Whenever you want to modify a custom spread you can click the cog button at the top of it’s column, or if you want to delete a custom spread, you can tick the tickbox at the top of it’s column (circled in red below), then click the delete button (circled in orange below). 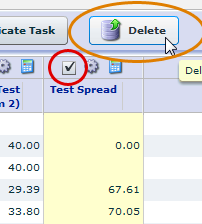 Make sure if deleting custom spreads you don’t have any of your tasks ticked as this may result in them and all their marks being deleted also. 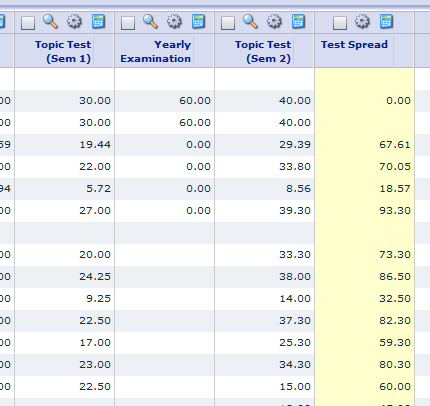 Only have ticks in the tickboxes above the custom spreads you wish to delete and nowhere else.